This quick and simple pasta sauce makes brilliant use of frozen spinach. The spinach is cooked with strong cheddar cheese, cream cheese, garlic and salt and pepper before being tossed with pasta. It's a simple recipe, but it's a great one for whipping up when you're in a bit of a hurry to feed the kids after school. Cook the pasta according to packet instructions in boiling salted water. Meanwhile, puree the spinach and then heat the frozen spinach in a large pot until just about to boil. Stir in the cheese, cream cheese, minced garlic and salt and pepper. If you need to thin it out, add a few tbsp. of the pasta cooking water. Taste the sauce and add more cheese or seasonings as you deem necessary. Once the pasta has cooked, toss it with the sauce. 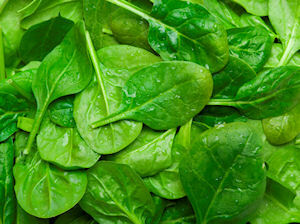 Make this with fresh spinach if you wish, just make sure you wilt it and squeeze out excess water before you use it. This recipe serves 4.